With a billion of registered users, Twitter has undoubtedly experienced an explosive growth attracting the not so famous to celebrity users. But, only half of the active users who tweet at least once a month live in these countries: the US, Japan, Indonesia, the UK and Brazil. Statista, an online statistics portal created a chart using data from Peer Reach showing the highest shares of monthly active tweeters. Peer Reach and Twitter however, has different definitions for their monthly active users. Peer Reach considers monthly active users as those who tweet, whereas Twitter’s considers all users who log in as their monthly active users. Based on the Peer Reach’s definition, US top the chart with 24 percent of active users every month followed by Japan with 9.3 percent and Indonesia with 6.5 per cent. The United Kingdom also contributes a good share with 5.6 percent preceded by Brazil and Spain both holding the fifth position with 4.3 percent active users. After the top 13 countries, users from rest of the countries in the world represent the remaining 26 percent of monthly active Twitter users. 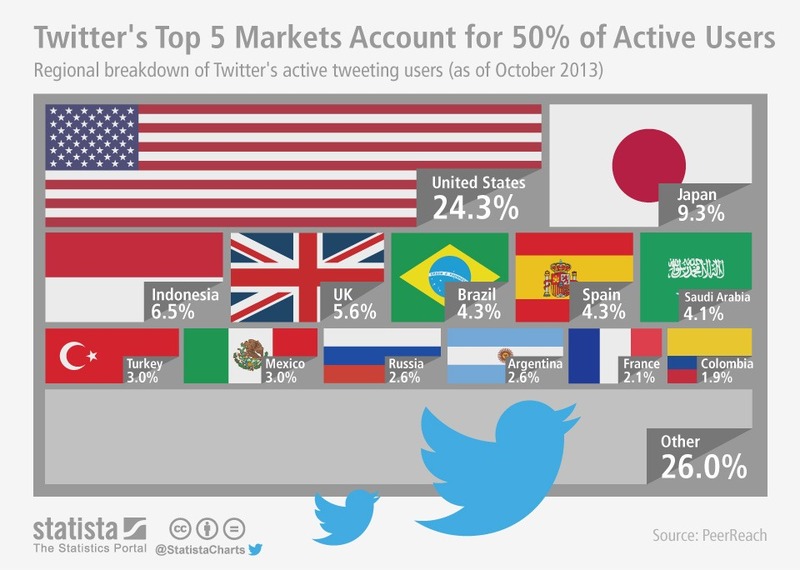 Even with the most Twitter users in any country, U.S is way behind in Twitter penetration. Peer Reach also looked at the percentage of Twitter users in a country relative to its online population and found that, the US isn’t even in the top five. Saudi Arabia had the highest percentage of Twitter users with 32 percent of Saudi Arabia’s online population using the micro blogging service. The top five countries are non-English speaking nations including Saudi Arabia, Indonesia, Spain, Venezuela and Argentina. After comparison it is found that, the US only ranked 8th in Twitter penetration. The fact that internet users in these two countries Saudi Arabia and Indonesia do not have access to a PC, but access the internet through mobile is encouraging for Twitter. The top ten countries with highest active monthly users of Twitter are: 1) Saudi Arabia, 2) Indonesia, 3) Spain, 4) Venezuela, 5) Argentina, 6) the UK, 7) Netherlands, 8) USA, 9) Japan and 10) Colombia. New Vision Digital is a digital marketing agency providing a wide spectrum of services including SEO, SMO, Social Media Marketing, Pay-Per-Click Advertising, and Website Design. Company prides itself in its ability to offer cutting edge solutions to clients in their respective market niches.